First of all, thanks for the hat tip on the Susskind paper, much of the basis for this whole post. Second, the ERBE project did not last for 5 years, but 14-15 (1985-99). Fourth and last, good to see that ENSO is given its rightful place in this whole issue. That process, fed by energy from the Sun, is after all what drives global temperatures. Not CO2. That process, fed by energy from the Sun, is after all what drives global temperatures. Not CO2. Oh, please. ENSO drives cyclic variation in global temperatures. That’s cyclic variation around a long term mean. CO2 is a driver of the long term mean. First – I assume a tongue in cheek thanks. Which I can understand from your point of view. Although from my point of view I had that paper and had started working on a post on that topic. Afterwards I found it was one of your papers.. well, hat tip to you. Second – ERBE – I’ll come back to this one. As you haven’t done your own research I will provide mine. Third – there is a difference between a principle and a value. You are comparing principles and implying that this means the values also are equivalent. 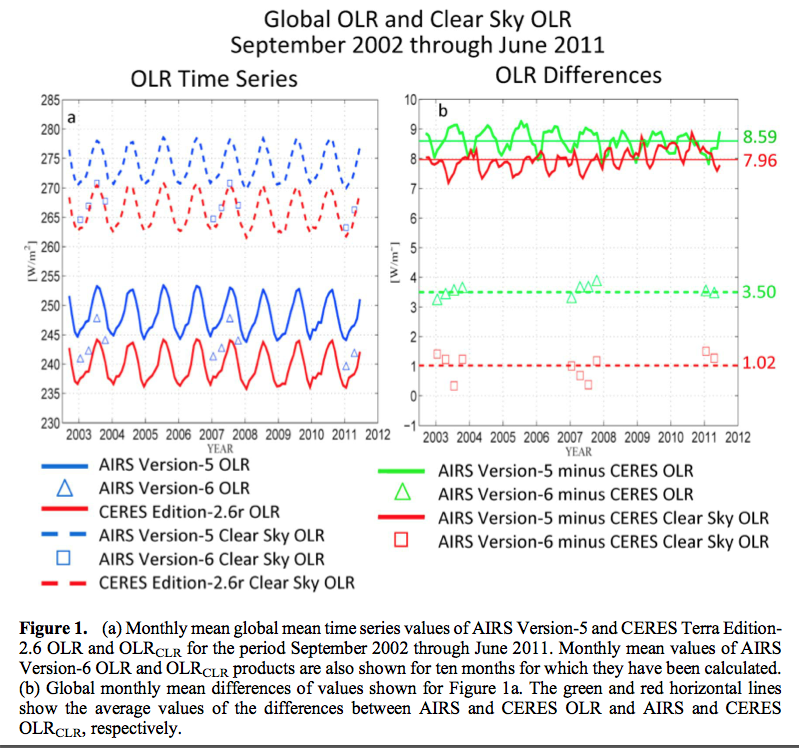 CERES and AIRS find similar but not exact OLR. The reason that datasets like ISCCP FD exist is precisely because the measured datasets from that earlier era are not accurate enough from a number of points of view, just one of which is long term drift. The same principle governs both parallel activities. My question is, what is the accuracy of the pre-CERES era? If we look at the CERES era, a big step forward in measurement we find interesting commentary.. ..Differences in SW trends between the two records are generally smaller than 0.3 Wm-2 per decade. For global LW, CERES Terra shows a 0.63 Wm-2 per decade steeper increase than CERES Aqua. The cause for the drift between Terra and Aqua LW TOA fluxes is due to an artificial discontinuity in the middle of the Aqua record that will be corrected for in the next release (see Appendix 2 for more details).. 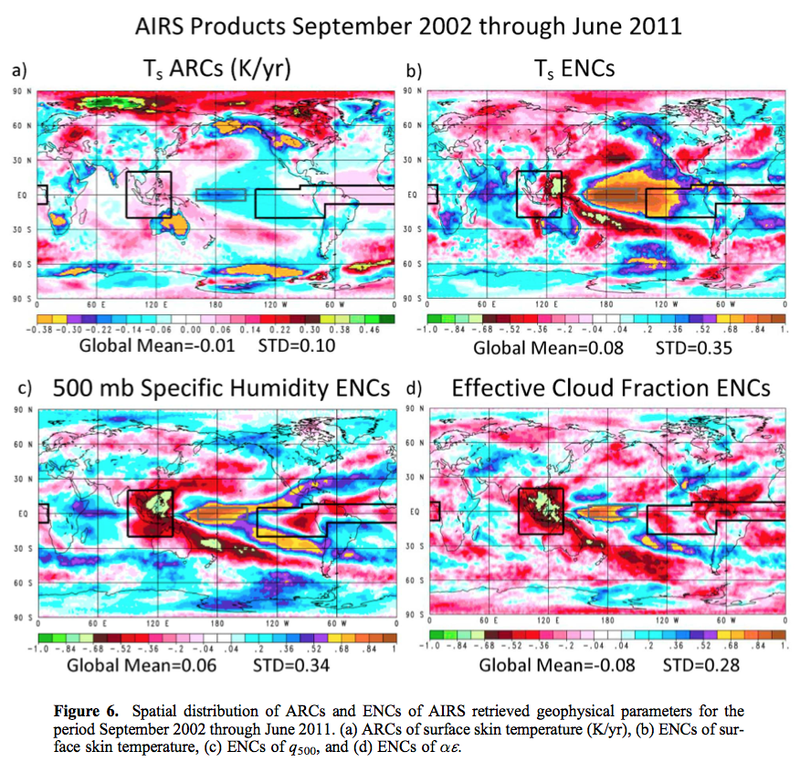 ..There are now over a decade of cloud, aerosol, radiation and atmospheric state observations from advanced satellite instruments aboard the Terra and Aqua spacecrafts, and close to 5 years of vertical cloud and aerosol profile data from CloudSat and CALIPSO. These data provide a rich resource for studying ERB variations and the underlying processes. With the latest CERES calibration improvements, large-scale top-of-atmosphere (TOA) radiation changes during the past decade are observed to within 0.5 Wm-2 per decade based upon comparisons between CERES Terra and Aqua, and between CERES and SeaWIFS, MODIS and AIRS.. In the (much-improved) CERES era, with 2 CERES instruments on 2 satellites and an AIRS instrument all in direct comparison we can identify 0.5 Wm-2 per decade. Which is precisely the reason for my asking the questions I did ask and you didn’t answer. What do you believe is the accuracy (absolute and wrt drift) of the pre-CERES satellite observations? The ERBS Nonscanner WFOV calibration stability uncertainty is an order magnitude better than its total uncertainty and is estimated from observations to be on the order of 0.35 W/m2 over the 1985 to 1999 time period of the Edition 3 Revision 1 ERBS data. This comes from a source I can’t verify – ‘Appendix A’ which appears to be by Wong and Wielicki (two well-known people in this field). 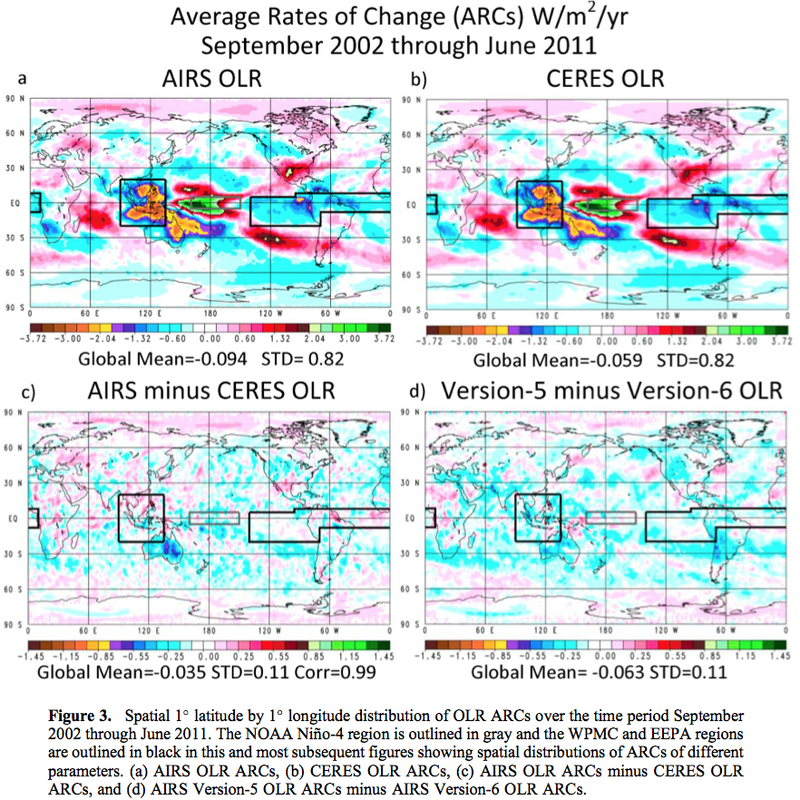 This appendix does reference the later data correction from Reexamination of the Observed Decadal Variability of the Earth Radiation Budget Using Altitude-Corrected ERBE/ERBS Nonscanner WFOV Data, Wong et al, Journal of Climate (2006). by new findings on the possible effect of small but significant ERBS altitude changes over the 15-yr period, has been completed. This satellite altitude change and its effects on the top of the atmosphere ERB are discussed in section 2 using the new altitude-corrected WFOV Edition3 dataset. Section 3 presents results on a small WFOV shortwave instrument drift and its effects on the ERB record. This instrument drift was discovered during the validation of the WFOV Edition3 dataset and is not currently included in the archived WFOV Edition3 data, but a simple correction method is available to the data user to remove this instrument artifact.. The point of referencing this paper and the quote is that stated accuracy is usually a best-case result. Then reality causes either a revised dataset, or a widened accuracy. It’s rare to find it the other way round, although I believe CERES provided better than expected accuracy. The annual cycle of the global mean TOA net radiation has a reasonably well-determined peak-to-peak amplitude of approximately 15 W/m2, with maximum positive values occurring in late Southern Hemisphere summer. The nonzero values (a few watts per square meter) of the annual average global mean TOA net radiation found from ERBE and ScaRaB data are an indication of observational uncertainty rather than of global radiative imbalance. The geographic distribution of the LW flux emitted to space (also called outgoing longwave radiation) provides useful information on the overall state of the surface–atmosphere column. Important progress has been made in establishing the climatology of these quantities, thanks in particular to the Nimbus/ERB (Earth Radiation Budget) and the ERBE missions of NASA, but sampling problems continue to limit accuracy. Strong biases remain likely, especially, but not only, in the shortwave fluxes. Because these biases depend on the particular orbit–instrument combination and SW absolute calibration, and because TOA ERB components are vertically integrated quantities, detection of global climate trends in the ERB is probably illusory. And Comparison of measurements from satellite radiation budget instruments, Louis Smith et al, JGR (2006) has a lot to say about inter-satellite comparison, but in a way that I find hard to turn into decadal drift numbers. I’m looking forward to your comment fifth and last, in response to my comment explaining why increases in GHGs, all other things being equal, would not be expected to cause a decadal reduction in OLR. That’s my best estimate of your hypothesis. I probably got it wrong though. One can obviously bias trends by picking the difference point in the ENSO cycle as starting and ending dates. Why isn’t it possible to pick starting and ending dates which represent similar states in the ENSO cycle? That’s a good question. In the case of this paper it is just using the longest time-series available. 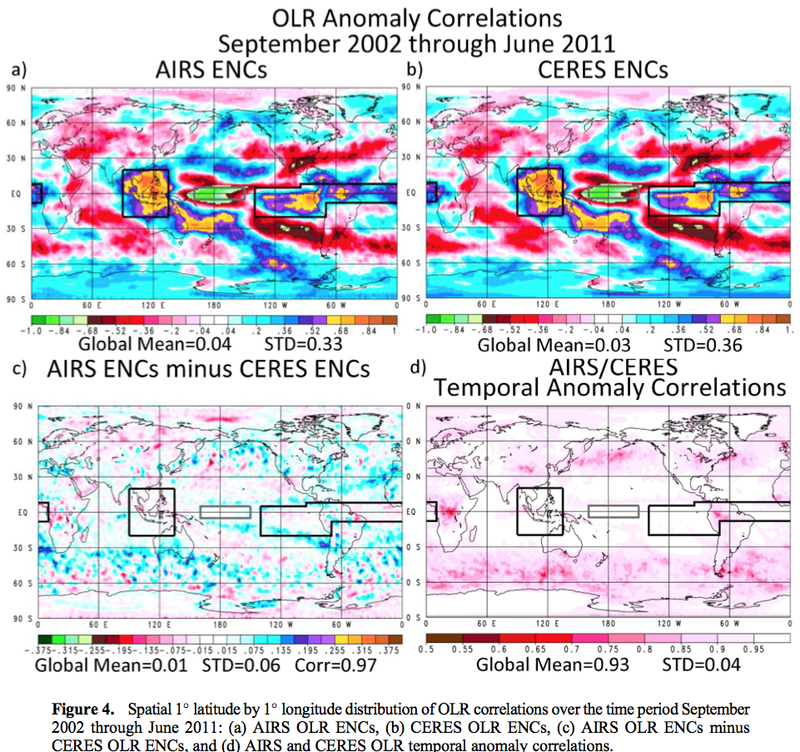 The correlation of OLR with El-Niño seems pretty clear – or do you disagree? For matching up the same states in the El Niño cycle I wonder whether this is possible. After all, it is a chaotic system. How do you define similar states in a chaotic system? We have El Ninos and La Ninas, but they don’t follow a rigid alternative pattern, they have very uneven strengths and durations.. So, the broadband measurements ( back to 1974 ) are probably not as accurate as subsequent systems. Still, it’s interesting to look at the series. 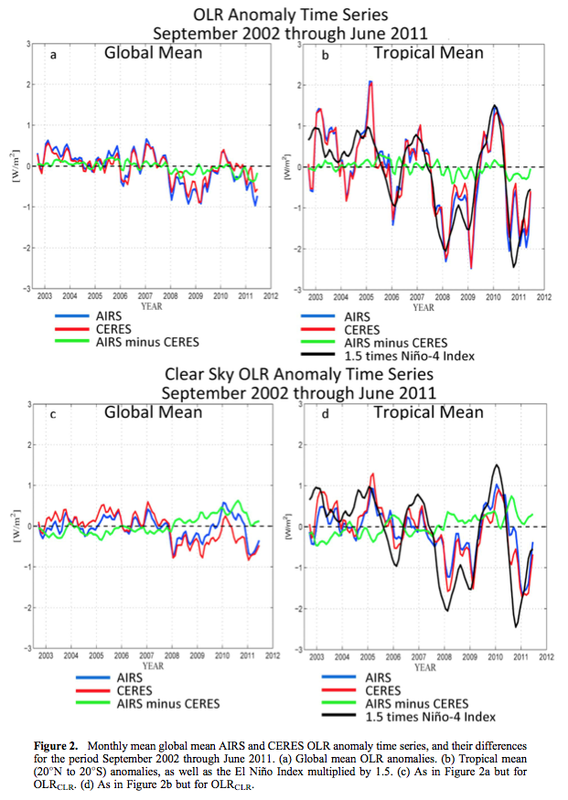 What is the source of the NOAA graphs of OLR? Problems likely abound with this dataset, but it’s probably the only longer term estimate of OLR. SOD: The correlation with ENSO seems clear, but not how to address it. By choosing an appropriate time in the ENSO cycle, one can get all different kinds of answers about whether surface temperature has “significantly increased” over roughly the last decade, so I would hope they would have avoided that problem here. To try to match states, one could try one of the various indexes of ENSO. Look at the value of the index for the last month of data and find the earliest month with a similar value. Then look at the value of the index for the first month of data and find the latest month with a similar value. Calculate the trend over both periods and report the range. Off the top of my head, an ARMA process with drift. That is an ARIMA (p,d,q) process with d constrained to be zero. and all of the AR coefficients must be less than one with a possible linear trend. I think you can make a very strong argument that no weather related process is a random walk. It could be fractionally integrated, but you don’t have a long enough time series to tell. I’m building an interesting model. I’m not trying to answer any question about El Nino. 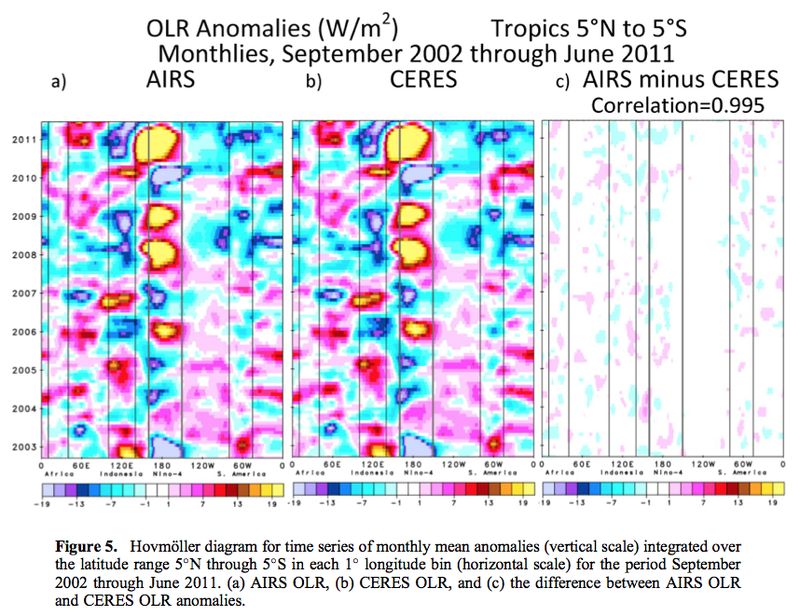 I’m adding OLR noise “in the style of” El Nino. Right now I’ve got a couple of sine waves of different frequencies (8 yrs and 2.5 years) added plus some monthly noise and that’s actually not too bad. I think I need some frequency variation as well – but if you go from sin(2πft) to sin(2πt (f . random_f_factor)) you get a feature that changes as time increases – higher frequency components appearing later in the time series. There’s an obvious answer but I’ve only just arrived at this point. Probably should be phase noise instead on the main component. I don’t think frequency noise makes sense. It’s not ideal. It will do for now. 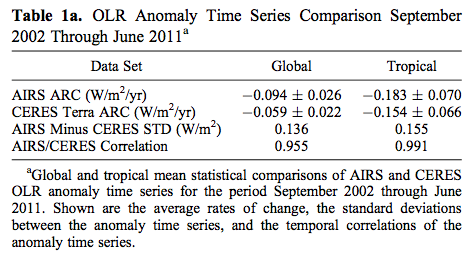 But if anyone has a suggestion for tropical OLR vs time “in the style of” El Nino then it would be appreciated. You don’t want frequency noise, you want the period to vary. There’s a difference. 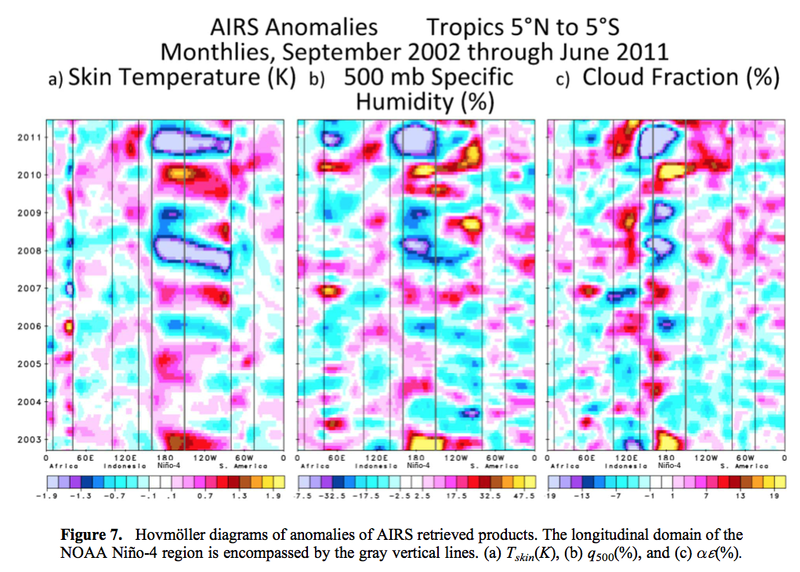 It might be interesting to compare the model with El Nino data in the frequency domain. SOD: You could check you output for realism by looking at the Fourier transform.